Some have heard of them, some have not, but I'm sure at one point we all have experienced some. So what is a parasitic drain? A parasitic drain is when an item in the electrical circuitry fails. usually it can be something as simple as a glove-box light not shutting off, to something as complex as a solenoid in the transmission shorting out, or even a bad circuit in the ECM/PCM itself. DVOM :: a.k.a. Digital Volt Ohm Meter :: it can be down with a analog style meter, but digital is A LOT easier. A helping hand :: grab a friend/brother/sister/ to give you a hand it isn't needed but makes doing the job a whole lot easier. So how do you track down the parasite to prevent further damage/headaches? First do a visual inspection, look at the glove box light, make sure it is turned off, go over anything visually look for bare wires or bad connections. 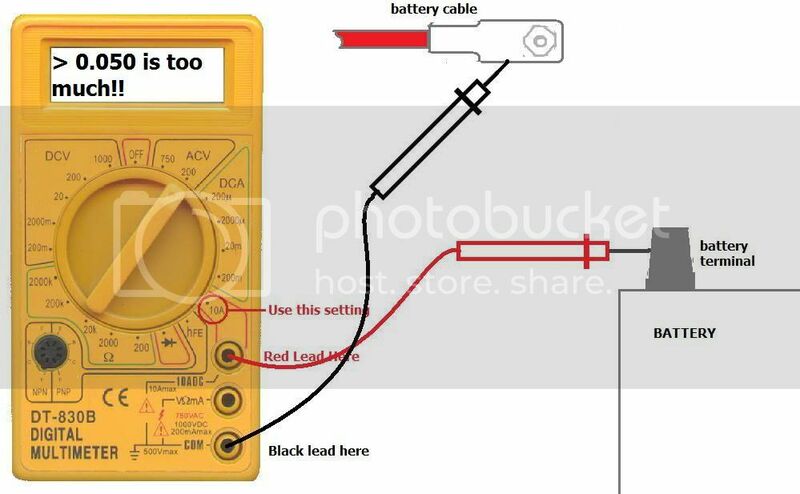 If the visual goes well and all looks to be ok, but the problem still persists; then grab yourself a DVOM (Digital Volt Ohm Multimeter), its time to check individual circuits. With the vehicle off and key out of the ignition. Set your DVOM set to the Amp setting, and the positive batter cable disconnected from the battery. Place the red lead of your DVOM on the battery terminal, and the black(ground) lead on the battery cable, double check to make sure all the doors are closed and any accessories you have are off. Everything good?, then you should see no more than .05 amps being drawn from the battery, this is normal as it is for the ECM/PCM and Radio memory. Have more than .05amps?, then you have a parasite some where, now to find it. To find one almost 90% of the time, all you need as a helping hand. while you (or a friend) watches the meter, remove the fuses one at a time until the amp draw drops back to .05amps, again making sure no lights or accessories are on. Now comes the trickier part, so you have found the circuit that is causing the drain, but there may be up to and exceeding 10 things on that circuit. You will have to grab your wiring diagram, and look to what is on that circuit and test each part either for a faulty switch, internally shorted out connection, bad sensor, or what have you. Find the part, and either fix it if you can, or replace it. Some parts are harder to diagnose than others. There are a number of people on this site with a great amount of knowledge to assist you in trying to diagnose an electrical problem. But please for the sanity of out Mods, do a search and LOOK to see if what you're asking has been posted before, you might be surprised by how many people have already gone through what you are currently. joesmokabo and CROMBOOGIE like this.